Home Education Should We Encourage Kids To Do 'Extra' Math? 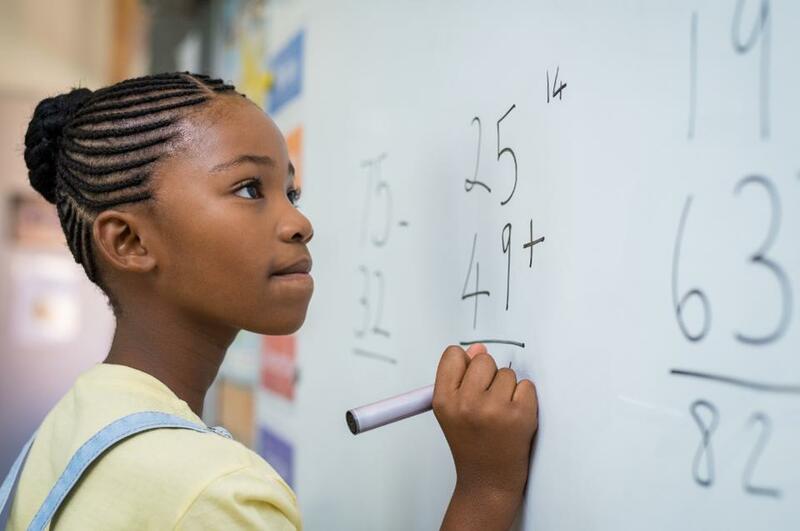 Earlier this month, Barbara Oakley, engineering professor at Oakland University and author of “Learning How to Learn” published an opinion piece called “Make Your Daughter Practice Math. She’ll Thank You Later” in the New York Times. “You and your daughter can have fun throwing eggs off a building and making papier-mâché volcanoes, but the only way to create a full set of options for her in STEM is to ensure she has a solid foundation in math. Math is the language of science, engineering and technology. And like any language, it is best acquired through lengthy, in-depth practice,” Oakley wrote. Her piece has received quite a bit of feedback. For example, readers have currently posted 642 comments on the article. Parents, teachers and others shared their insights in the comments. While many commenters shared personal success stories about the role that math practice played in their – or their child’s – success, others have shared their disagreement with different aspects of the article. “But girls especially could benefit from some extra required practice, which would…build confidence and that sense of, “Yes, I can do this!” she wrote. A meaningful parallel can be drawn between raising literate kids and raising numerate kids — in other words, ones who are able to understand and work with numbers. Numeracy is just as critical as literacy for kids’ long-term success and even safety (Did you know that innumeracy can even harm your health? ), but it often takes a backseat to literacy conversations. It’s also often overshadowed in our actions. For example, many parents seem delighted to read countless bedtime stories to their kids, helping them develop literacy, but hesitant or anxious about the notion of incorporating numeracy goals into everyday life. The fact that so many kids balk at doing math homework by asking “When am I ever going to use this?” is a testament to our collective failure to show kids the uses for math and the necessity of learning it. We approach children’s literacy with more realistic expectations than their numeracy. As a former library employee, I saw firsthand how much effort, time and patience that parents, teachers and other caring adults invested in helping kids develop their literacy over time, using a variety of activities. Yet with math, the expectation often seems to be that completing the assigned homework problems is enough to help kids become numerate, and that other math done outside of these assignments is “extra practice.” I think framing the idea of spending more time with math as “extra” makes it feel simultaneously optional and burdensome, when in reality it doesn’t have to be either. Instead, just as parents might say “Let’s read this bedtime story” rather than “Let’s practice some extra reading,” they need to find ways to cuddle up with their kids and math, because the children’s present and future successes depend on it. Read math-themed books (such as “You Can Count on Monsters: The First 100 Numbers and Their Characters” by Richard Evan Schwartz and “Ten Magic Butterflies” by Danica McKellar) with your child. Find interesting ways to connect math with your child’s interests. For example, if the interest is soccer, then the two of you could kick the ball back and forth at different angles and talk about how these angles affects how the ball travels. Let kids feel important by giving them fun math-related “jobs” for projects you work on together. For example, let them be “the measurer” when you bake together (but remind them if they don’t pay close attention to measuring the ingredients, then the cake or cookies might not be as tasty!). Get creative. For example, if you need to buy soil for a garden bed, you could have them measure the length, width and height of the bed, then work together to calculate its volume and estimate how much soil you need to buy. Encourage connections with adults who are enthusiastic about math. If this isn’t you (or your partner, if you have one), see if your friends or other parents you know might be willing to talk with your kid about why they enjoy math and how they use it. Offer to have the conversation at an ice cream shop, park or other pleasant meetup spot. Avoid using phrases such as “I’m bad at math” in front of your kids. These perpetuate the stereotype that certain people are “math people” and others aren’t, rather than promoting the idea that everybody uses math (and can be good at it) with hard work, patience and help. Also, channel your inner confidence as you communicate with math about your child, whether you are helping them with their homework or pointing out exciting examples of math in everyday life. After all, some studies show that math-anxious parents can transmit this anxiety to their kids, even undermining their children’s achievement. This article was written by Rachel Crowell from Forbes and was legally licensed through the NewsCred publisher network. Please direct all licensing questions to legal@newscred.com. previous Who Are the Hidden Teachers in the Computer Age? next Will Robots and AI Eventually Become Common in Education?